The FoodSaver Vacuum Sealer helps you save money on groceries and keep your food fresher longer. I thought I’d share what I like about the FoodSaver — specifically, the Vac 800 model. It’s the best one I’ve seen to date. In a nutshell: By sealing out the air when storing leftovers or fresh meats, you are making your foods last longer in the refrigerator or freezer. We’ve had our Foodsaver Vacuum Sealer for nearly 2 years almost 9 years now, and we use it all the time! For prolonging the life of foods. It works especially great with foods like lettuce, salsa, and cheeses — items that you store in your refrigerator and use on occasion, but not on a daily basis. 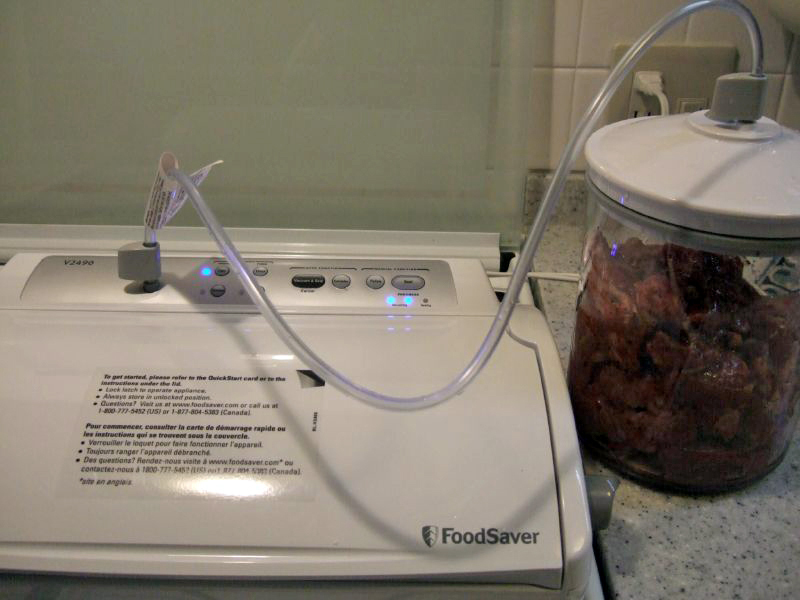 For us, the Foodsaver works wonders with lettuce and salad greens! Lettuce which used to get wilty, lose its crispness and turn soggy in no time now lasts 2 to 3 weeks in our refridgerator! For marinating steaks in minutes rather than hours. Start by placing a couple of steaks in the canisters that the FoodSaver comes with. Then pour your marinade over them, vacuum out the air, and the liquid marinade gets pulled directly into the meat! Simply stick the open end of your chip bag into the FoodSaver, and walaah… you’ve got a strong heat-seal to keep your chips fresher longer. This completely eliminates the need for "chip clips". NOTE: Chips are not "vacuum-sealed" to remove the air from the bag — because that would crush the chips. Instead, potato chip bags are permanently sealed to keep more air from reaching your chips! There are literally hundreds more ways to use the FoodSaver. The kit itself comes with a booklet that lists all the ways to save on your grocery bill by ultimately prolonging the life of your food. In addition, there’s a really active FoodSaver group that posts ideas and answers any questions you might have. I found some interesting tips and ideas there when I first got mine. Oh, and I also use the attachment that lets you vacuum seal things in Mason jars, too! • Keep matches (and other things) dry when fishing or camping. • Vacuum seal important papers to prevent possible water damage or mildew should your pipes burst or in the event of a flood. • Keep first-aid items –such as bandages and gauze, fresh — clean and ready to use. • Vacuum pack clothing for storing in small spaces. • Vacuum seal and freeze water for instant ice packs. When the ice melts, you can re-freeze or drink the water. • Vacuum pack a change of clothes in case you take an “accidental” spill in the lake. My biggest fear initially was that I’d be buying another contraption that would just sit there and take up space on my countertop. You know, much like a new treadmill or weight machine… some things eventually become dust-collectors, despite your best intentions. But, even afer 2 years, we still use the FoodSaver on a monthly (sometimes weekly!) basis. Mostly because it’s so simple to use. It takes just a matter of seconds for any food you wish to vacuum seal. And I like how you can use a Sharpie to write directly on the bags. And it’s not an eyesore. The FoodSaver is low-profile enough to blend right into your kitchen decor. I like the soft ivory color, but they also come in black and stainless. I used to store it on the counter (because I feared "out of sight, out of mind"), but now I store it in a deep drawer in our kitchen. I like that dust can’t collect on it, yet it’s lightweight and easy enough to quickly pull out of the drawer and use. UPDATE: It’s been several years since I initially wrote this post. I’m going on 9 years now with the same Foodsaver! I use it regularly, and it’s still in GREAT shape. To be more specific, I probably use it once a month (at the least) up to 3 times a month (at the most). 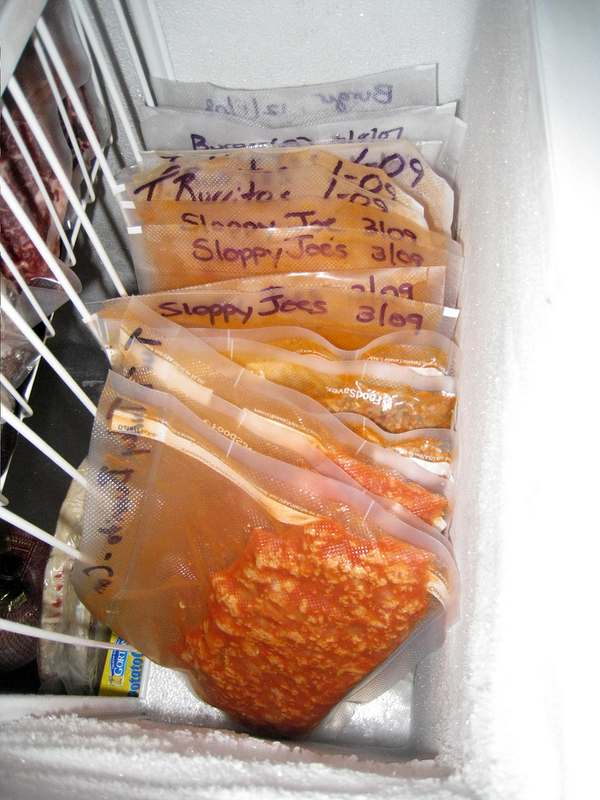 Some have asked where to find Food Saver bags. I’ve gotten mine at Kmart and Bed, Bath & Beyond in the past. They’re also available on Amazon. I prefer the continuous roll, as opposed to the pre-perforated ones because they’re more customizable. It’s like select-a-size for Foodsaver bags.